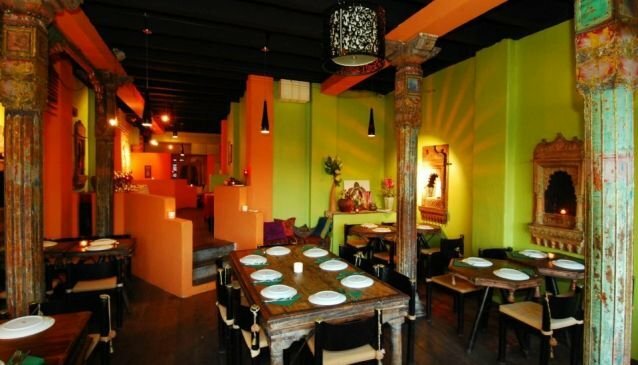 Look out for the large swing that graces the entrance of this charming restaurant, and step into the ancient kingdom of Rajasthan where a majestic wooden doorway invites you in for a taste of delectable Northwestern Indian cuisine. Choose to dine indoors within an exquisite setting reminiscent of a historical Indian mansion, decorated with copper, iron, teak and sandstone details, or outdoors along the picturesque Singapore River. Intricate décor, tea lights, themed cutlery and pretty plating all point to the restaurant's focus on attention to detail. Select from a contemporary selection with seafood and meats from Tandoor, Samundari curries, rice dishes with the most fragrant basmati rice, and more. Kinara is the perfect place for an intimate dinner for two or for a celebration for large groups.